“Leaps and bounds” — I see what you did there. As it turned it, it sold extremely well, eventually going to a second printing (also not a very common occurence in those long-ago Young Mike days). I know we didn’t have much backstock on it, and we’d buy back copies as they came in collections. This was quite the popular item for some time after its release, and even still today gets an inquiry from curious fans here and there. It’s an interesting look at the cross-promotion and sales strategies used for a comic that one would think would almost sell itself anyway. This was during the big 1990s comics boom, so something like this seemed like it was almost guaranteed to outsell the Bible anyway, but even in those times when the gold poured out of the rivers and the oil flowed freely, no one was going to take any chances. Even dragging in ol’ Fin Fang Foom and referencing the rest of the Marvel Monsters to get that crowd (you know, “them”) shows the extent of hype for this book. The listing of each guest star and why he’s of import is certainly a sign of the times, when any of these characters popping into any book usually meant at least something of a bump upward, if not necessarily in rack sales, but at least in retailer order numbers. It may still sorta be true today, but not nearly to the extent it once was, a combination of readers being a little choosier with their comics money and the fact that “Special Guest Appearances” of “hot” characters are no longer the huge sales pull due to overuse and overexposure. Wolverine’s “sales power,” once taken for granted as shown here, is no longer the sure thing. I think most interesting to me is the characterization of this storyline as a “fill-in,” which I think maybe surprises me a little. It never felt like a fill-in, like some inventory story or reprint pulled out of storage thanks to the Dreaded Deadline Doom. 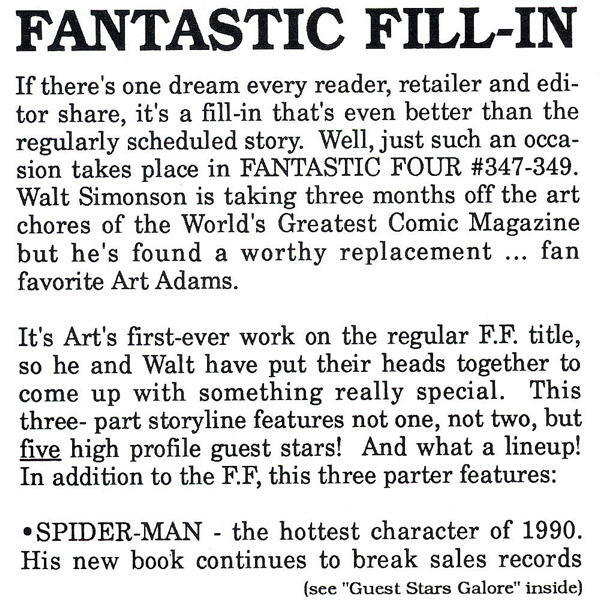 I mean, it was the same regular writer and a special guest artist…it may have interrupted the main storyline, but it didn’t feel intrusive (like a fill-in in the Simonson run a couple of issues later, which was…okay, but it was a real case of “well, I guess this’ll do ’til Simonson’s back”). 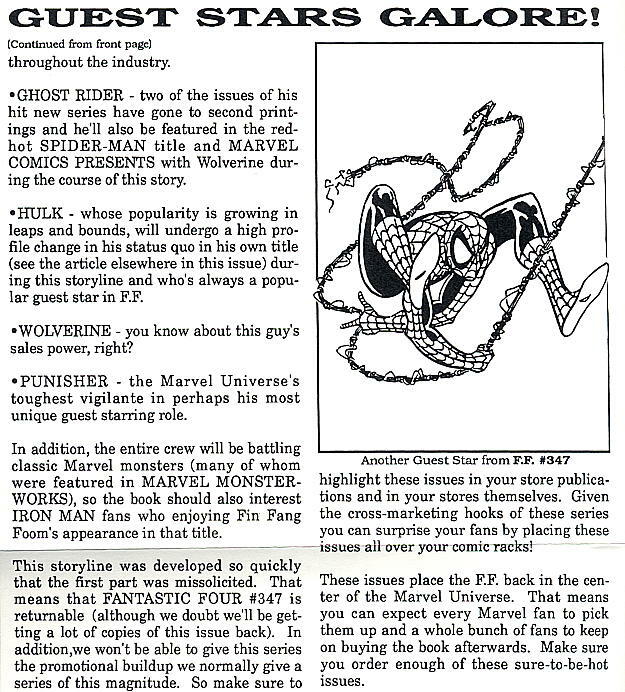 But as far as that advice to place copies of this comic “all over [our] comic racks” — yeah, I know one of Marvel’s publishing strategies was (and maybe still is) to make a retailer fill up his/her shelf space with all the Marvel product they could possibly carry, and crowd off everyone else. I mean, I get it, they wanted copies of this next to Ghost Rider , etc. 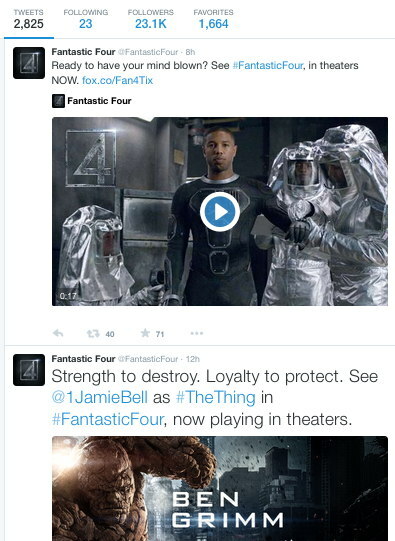 However, I’m pretty sure we just had them up on the rack under “Fantastic Four,” and it seemed to do fine. One last note…as to this being the Punisher’s “most unique” role…yeah, I think there’s a challenger. Things to Do in Southern California When Your Power is Out. Yup, came to work Sunday morning only to discover there was no power coming into my business. Now, for me, that’s not as big of a deal as it could be, since I can still sell comics and make change out of the register and such, so long as things are reasonably visible inside the building and, you know, they could pay cash and not by credit card. Several of my neighbors, what have to prepare food for their clientele, were not so lucky…particularly the Chinese restaurant just next door that was expecting a party of about 50 people. Oof. Anyway, stuck it out as long as I could, but alas, the shadows encroached too far and it was time to depart. And looking at the parking lot when I left, I was one of the last holdouts. Ah, well, power should be reinstated by 11 PM this evening (as I type this, it’s about 5 PM), so we’ll see what happens. So it was announced that the Fantastic Four comic book is coming back, and whether absence has made the heart grow Fantastic-er and people will go for it this time. I would certainly hope so…I would like to read a Fantastic Four comic again, and I’ve had a little feedback from customers along these lines as well. The current Marvel Two-in-One series, featuring the FF’s Thing and Human Torch (and also will continue alongside the new Fantastic Four series), has been doing quite well, particularly for a recent Marvel series launch, which tells me there’s at least some demand for half of the FF, at any rate. A couple of years back, I wrote a bit about a feasibility of a new FF comic, and about the line one must straddle between “doing new things with the FF which make them feel NOT like the FF” and “oh there’s Dr. Doom and Galactus again.” It’s a weird running-in-place that, to some extent, all mainstream superhero comic have to do…”the illusion of change,” as has been said, and when they do BIG changes, like marrying Spider-Man and Mary Jane, or giving Superman a son, it’s an even bigger to-do to get things changed back, a constant stuffing of worms into their cans. Not that the Fantastic Four really did go through any kind of big change like this…it felt more like they just kinda wore out their welcome, that nothing was really grabbing folks, so it was time to shuffle them off the board for a while. Now why them specifically and not, say, the Avengers, which could also have used a little time off (aside from the whole movie thing), given that many of Marvel’s longstanding properties could use a bit of rebuffing. One clever way of doing so was “retiring” characters without necessarily retiring them, such as having new people take over as the title character (as in the recent Thor comics) to rebuild interest in a property that had sort of felt a little moribund. They couldn’t do this with the Fantastic Four, really…the FF is specifically Those Four People, and occasional rejiggerings of said Four usually just serve to remind people, oh, hey, why isn’t, oh, Mr. Fantastic around? (The one possible exception to this was, outside the deliberately-gimmicky “New Fantastic Four” with Ghost Ride an’ such, was She-Hulk’s inclusion on the team.) My idea in that old post I linked was what would have basically been a Thing solo series, with the rest of the FF as back-up characters…maintaining the team dynamic, but making one character the focus and giving at least what would feel like a different perspective on the group. This is sort of what we got in the new Marvel Two-in-One series, with the Thing and Human Torch supposedly seeking the other lost half of their family…it’s a new take on the FF that doesn’t have the “Fantastic Four” logo on the cover and thus doesn’t feel burdened with the expectations that title brings. That’s a long way of saying “the creative team on this new Fantastic Four have their work cut out for them.” I want it to be good, and I have no reason to think it won’t be. Now will it do well, that’s harder to say. The comics market is still a bit unstable, and new titles, even with long-established characters, are struggling to survive. I’d like to think a comic starring the Fantastic Four, as quote-unquote “Marvel’s First Family,” would be above such economic concerns, that they would always have a starring role with the publisher, but sad to say the world doesn’t work like that. 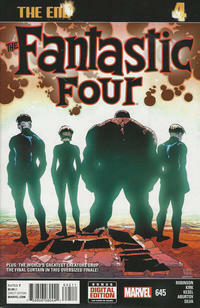 I really do hope for the best here…I’d love a good Fantastic Four book on the stands again. We’ll just have to see how everything shakes out. And yeah, I know, it’ll have a big ol’ “#1!” on the cover. What should the actual issue number be now? It’s #646, I think…unless they want to add all the Future Foundation comics to the total and get it closer to #700 before going to #1. I mean, at this point, why not? 1) Recent FF comics have been pretty good, actually. The main issue of late with ongoing FF titles, or any ongoing Marvel title, is that given current publishing strategies, a series doesn’t stick around for too long before being given the ol’ reboot/relaunch. And, FF titles of late, when they reach the endpoint of their “current” series, are given fairly definitive endings that wouldn’t naturally flow into a new storyline from a new creative team, thus necessitating reboot-ering. 2) There’s also the thought that Marvel is hesitant to publish comics that would provide grist for other movie studio’s mills, as film rights for the FF are held outside of Marvel Studios, which would explain the lack of a title for them right now. Of course, Marvel is still publishing X-Men comics, also not under the purview of Marvel Studios, but not publishing X-titles maybe a financial hit Marvel can ill afford, compared to the relatively small loss from not having a current FF title. Anyway, I’ve heard both support and debunkings of the “Marvel won’t publish books licensed to other studios” thing, so I have no idea what’s going on there. There are other points, too, that brought me to the position of thinking the Fantastic Four are past their sell-by date. Chris and Matt on the War Rocket Ajax podcast often mention about the repeating of certain character/plot developments, such as “Johnny has to learn to grow up and be responsible” which has happened a few times in recent memory. And then there’s the idea that if you keep going back to Dr. Doom and Galactus and the Negative Zone and “Is This The End of the Fantastic Four?” you’re just rehashing, but if you try to do different things and switch up characters and whatnot, suddenly “this isn’t the FF.” It strikes me that Fantastic Four probably isn’t the easiest comic book in the world to write. For support of that statement, I refer you to this piece I wrote long ago as part of an article about a sadly still-forthcoming Thing graphic novel (at the end of the page, in italics). The Thing really is one of the best characters, not just in comics, but in all of fiction. Yeah, that’s right, I’d put him up there with, like, Hamlet. In fact, I bet the Thing could totally take Hamlet in a fight. While that doesn’t remove the family-relationship drama that we may have seen over and over again in the title, presenting it from the Thing’s perspective will at least give us a slightly different angle on it. And by making it Thing-centric, the pressure is off from regularly featuring the other members of the family in the title…while possibly opening it to guest-appearances and other team-ups Marvel Two-in-One -style. Since this book wouldn’t technically be “The Fantastic Four,” that kind of character ‘n’ situation switch-up wouldn’t (hopefully) result in complaints that this isn’t the FF folks are used to. Plus, everyone loves the Thing, so I feel like this would be one heck of a book if done right. Oh, and someone remind me to add an “armchair publishing” category to my site. Just came to mind for some reason. A lot about the Fantastic Four, and a wee bit about Miracleman. And to be honest…aside from my memories of watching a whole lot of the 1960s Spider-man cartoon, and some random installments of various series here and there over the decades, I really wasn’t much of a Marvel cartoon watcher. 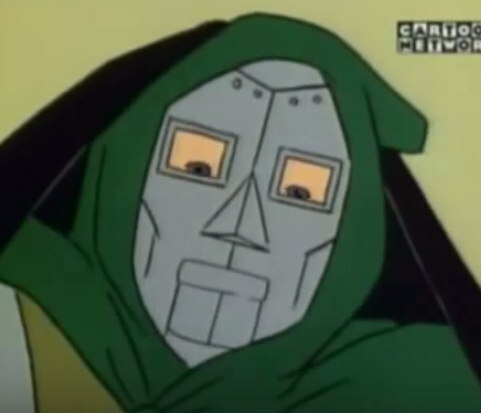 I have a vague memory of watching some animated version of Doom who spoke with a heavy accent, but I’m not sure what cartoon that may have been from, assuming I didn’t just cook that up myself in this aging brain of mine. The end result is that I don’t really recall enough about any of these cartoons to be able to pick out a fave Doom. …why, he’s adorable! That’s some voice he’s got, so watch enough of the video I linked there to experience it yourself. Other comments from yesterday: esteemed longtime reader G23 suggests that maybe they should just stop trying to do a live action FF altogether, and while I understand the frustration, I’d hate to not see one at all. Now, I realize a live action FF wouldn’t add anything to the comics, wouldn’t improve the overall state of culture, wouldn’t cure the common cold, etc. and so on, but boy I’d like to see one anyway, and I don’t think it’s so insurmountable a task that it can’t be done. I know it’s fanboyish wishful thinking, but it’s so fundamentally a part of the artform I’ve devoted most of my life to, I’d hate that the world at large wouldn’t get to experience at least some portion as to why we all like the FF so much. In fairness, though there was a lot they didn’t get right, at least those two previous Fantastic Four movies managed to do a good job with Aunt Petunia’s favorite nephew. The Thing, as I have noted before, is one of those creations that is so strong on its own that its basic essence can survive even the worst circumstances, though I understand the new film puts even that to the test. Anyway, I think a good FF film isn’t impossible. It’ll probably just take a little more understanding about what made the original comics work, and a little less fixing it ’til it’s broken. Another longtime commenter Jer notes that the problem with getting a Dr. Doom that’s like the Dr. Doom in the comics comes down to basic Hollywood blockbuster film-making. Everything’s gotta tie together, that gun in Act One better shoot something in Act Three, an’ all that. The trend — and Jer lists several examples — is that the villain is inextricably tied to the hero’s origin. And, in a way, the Doom of the comics is tied to the heroes…specifically, to his old college roommate Reed Richards, who tried to warn him about his experiments, and, well, you get the picture. But that’s probably not dynamic enough for a Big Moving Talkie, so we get the Doom who’s caught in the same accident as the rest of the FF and thus also gets superpowers. Now arguably, one could say that there’s no such connection between the film versions of Superman and Lex Luthor, or between Nolan’s version of Batman and the Joker. But even without an origin/plot connection, there’s a thematic connection: brain versus brawn, order versus chaos. I suppose Reed Vs. Doom could be “science for good vs. science for evil,” but that’s not quite as basic a thematic struggle on which to hang your superhero movie, I guess. At any rate, we’re probably some ways away from the next attempt at the World’s Greatest Comics Magazine That Hasn’t Quite Managed A Great Movie Yet, but I hear tell the final battle in the new film actually approaches the FF we know. Maybe, on the very slim chance the planned sequel actually happens, we can get past this rough set-up and get down to the business of punching Galactus and tangling with the Impossible Man, as God, and Stan and Jack, intended. In other news, someone asked Neil Gaiman on the Twitterers how many new issues he and Mark Buckingham were going to produce to wrap up his Miracleman story, and the answer was “about nine.” The reprints for the previously-issued Gaiman and Buckingham comics are about to start up, so we’re that much closer to seeing some decades-old plot threads finally getting resolved. Barring any more production errors, of course. What if the surprise villain in the new Fantastic Four movie is just a completely faithful adaptation of the Impossible Man? My first response upon cracking open the case of these Dancing Groots was “oh no, they have ‘try me’ buttons” which means I can expect to hear these every single day for what little remains of the rest of my life. And then the thought occurred to me “I wonder what it would sound like if I pressed all of the buttons at more or less the same time,” quickly followed by the idea that I should take a video of it and share it in all the places listed previously. And thus, there it is…the Camarillo Local Groots Choir, performing just for you. 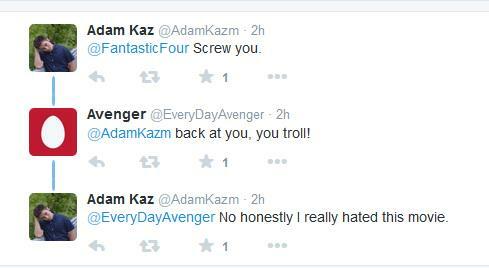 In other news, there’s buzz about for the new Fantastic Four trailer, mostly because we’ve been hearing terrible things about changes made to the concept that strayed perhaps too far from its comic book origins, and this is our first look at what the filmmakers were actually doing. And…well, it at least seems like it will look nice. Some have noted that the trailer seems a mite too serious for something that’s called the “Fantastic Four,” but the more somber tone does differentiate itself from the previous FF movies. Plus, it now looks like a highbrow sci-fi movie rather than just another superhero film, which I find a bit more interesting, and perhaps more in line with the actual origins of the comics. Well, okay, maybe not the “highbrow” part, but you know what I mean. As for the reported changes in the FF’s origin….I don’t know, I think so long as we end up with something approximating the characters and relationships we know from the comics, it almost doesn’t matter how they start out. It’s almost enough that the receive their abilities from scientific misadventure, which is close enough. (And most people going to see the movie won’t notice or care that the origin’s been fiddled with.) At any rate, the trailer did its job: it’s piqued my interest in a film I was somewhat indifferent/mildly negative about. 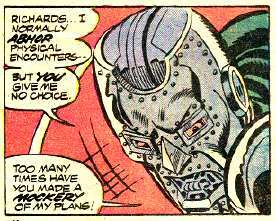 That doesn’t mean I wouldn’t like to someday have an actual Doctor Doom in a Fantastic Four film who was Reed’s college roommate who blew up his own face in a failed experiment and later got armor from monks, but there’s always the next reboot in, like, four or five years from now. The Arkham House of Ideas. 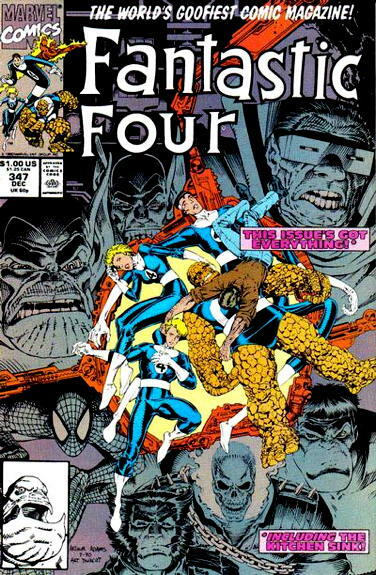 As I was thinking about this diversion over the next day or so, I realized that I quit before getting around to the Fantastic Four, which could only be “ The Phantasmagorical Four ,” so obvious a name that I’m certain I’m stealing it from some read-but-now-unremembered comic. But it also got me to thinking that one of the elements associated with Lovecraft’s horror stories is that the very thing that is horrible is hidden, or indescribable, or otherwise obscured from full understanding or comprehension. I inferred from this statement that he intended for me to fetch this book for him. Though I have spent little time in Richards’ personal study, I had no trouble spotting it amongst the many shelves burdened with books of science and history, both well-studied and obscure. It was a thick tome, discolored by age and resting on a shelf just barely out of my reach. I turned away from the professor to find the stepping stool or ladder that he must have somewhere nearby to facilitate the retrieval of books stored at such an inconvenient height. However, oddly enough I found none immediately evident, but my curiosity regarding this discovery was interrupted by…. What could I call it? A sense? A “feeling,” like the sort one would have when another person is peering intently at you, and you know for certain that you are being so rudely stared at even without directly confirming it yourself. This, however, was not the weight of another’s intense observation I felt upon me. This was the feeling that something was behind me, not approaching me, but passing by, twisting and serpentine, splitting through the air with haste. I saw nothing of what it was, frozen briefly by the sensation, staring blankly at a crowded row of books only a foot or two away. I heard nothing, save for what sounded for all the world like the hard cover of a book briefly scraping along a high and distant shelf. Just as suddenly as the feeling had come upon me, it was gone; and, the spell broken, I spun around to try to determine what had just occurred unseen behind my back while I had vainly looked for a ladder that wasn’t there. Professor Richards was still seated in his chair, as if he’d never left it, and it creaked again lightly now as he once more leaned forward over his desk. It was not to study his papers, I saw to my surprise, but rather to read the book of Egyptology, the very one that had been sitting on the shelf moments before. I thought perhaps it was simply a twin of the volume, maybe one that Richards had stored in a desk drawer and removed unheard, but a quick glance upward revealed that the book that was once there, was no longer. I tried to form the words, to ask the professor how he had done it, but as I was even drawing the breath to speak, Richards turned away from his studies only long enough for a terse “That will be all.” I found my need to question wither away, replaced by a relief at having reason to depart. As I approached the door of Master Storm’s room, I felt the chill of the house alleviate somewhat, which I naturally attributed to a roaring fireplace or a radiator. I rapped my knuckles on the wooden door, and even that brief contact related the warmth of the room beyond. A cheerful welcome was called out to me by young Jonathan, bidding me to enter, so I grasped the door’s handle…and found it hot to the touch. Not so heated as to cause injury, but certainly enough to take notice at how unusually hot it was. Irrationally, I feared for Storm’s life, though I had heard his voice, unafflicted by fear or pain, only seconds before. I quickly twisted the handle and pushed open the door, expecting…gouts of flame, perhaps? Inside, however, was not a raging conflagration; there was simply Master Storm, reclining on his sofa, obviously in no distress as all. I cast my gaze about the room, seeing no radiator, finding the fireplace unlit and unstoked, apparently for quite some time. Even the lamps were dimmed and barely provided enough illumination for the space in which I found myself. I found no source for the warmth I could still feel beating against me, except from the devilish grin upon Storm’s countenance, taking untoward amusement in my bafflement. I’d turned away only for a moment, but when I turned back, there was Mrs. Richards, who had seemingly materialized out of nothingness as far as I was concerned. Even with my back to the professor, the one entry to the study was still within my eyesight, and I am of absolute certainty no one had entered. What is even going on in #6. § October 9th, 2005 § Filed under fantastic four Comments Off on What is even going on in #6.